May has been a busy month for Earth Networks! We’ve been traveling throughout India during pre-monsoon season for a few very important events. Two of these events occurred on 17 May 2018 in New Delhi and on 23 May 2018 in Mumbai. 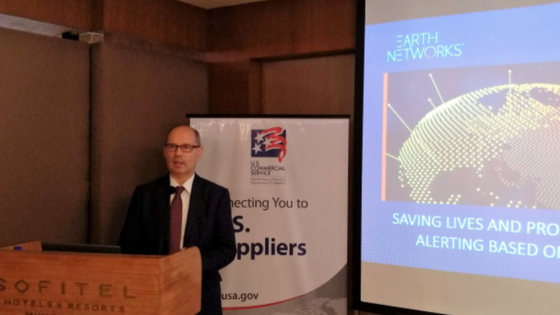 “Saving Lives and Property through Severe Weather Alerting based on Total Lightning Detection” was held in conjunction with Earth Networks, the U.S. Commercial Service, and US Embassy, New Delhi. 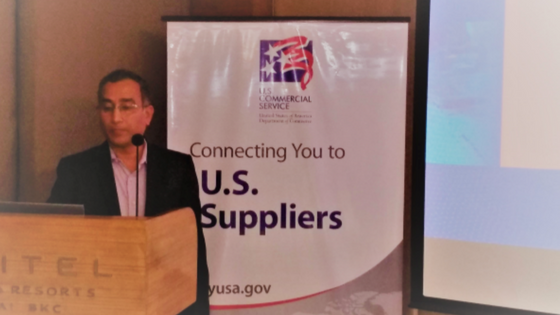 On the 23rd, we gave the same presentation with the U.S. Commercial Service and the US Consulate General, Mumbai. Skymet Weather Services, our partner in India, also supported both events. During these hour-long presentations, attendees learned about the many benefits of using total lightning detection to protect people and assets from severe weather. Total lightning detection is the most advanced way to forecast dangerous weather conditions from deadly cloud-to-ground lightning strikes to monsoon season flash floods to devastating wind storms. Cloud-to-ground lightning only makes up approximately 20% of all lightning strikes. The majority of lightning strikes are in-cloud. That’s why we detect both with our total lightning network. 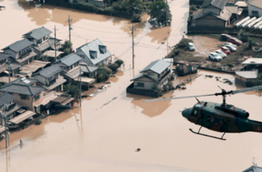 Systems that only detect cloud-to-ground strikes are missing out on some of the most pertinent weather data when it comes to protecting lives and property. 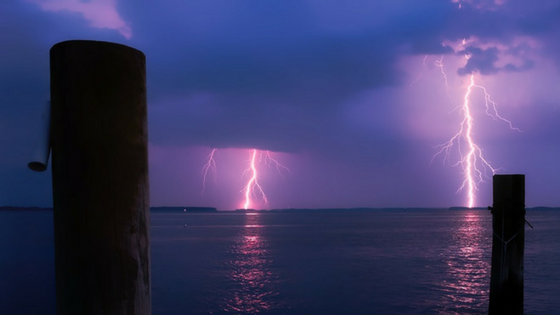 By using in-cloud and cloud-to-ground lightning, we generate the most advanced Dangerous Thunderstorm Alerts that give governments and businesses the most lead time to protect people and property. Severe weather is a monumental problem for India. Just last month, a devastating dust storm killed over 100 people and injured 200 more in the states of Uttar Pradesh, Rajasthan, Punjab, and Andhra Pradesh. 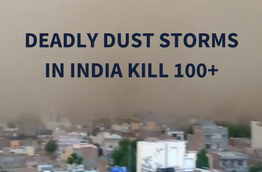 With dust storms, thunderstorms, and heat waves, India is constantly battling life-threatening weather conditions. In fact, lightning alone kills nearly 2,000 people throughout the country every year. That’s why we’re working with various Indian States to build a nationwide lightning detection and alerting network. The best way to mitigate severe weather risk is to be prepared. We know this. Now, it’s time to prepare the entire country of India for monsoon season and beyond. If we can work together to deliver severe weather alerts through channels those at risk actually use, we can help the government of India protect people and property all year long. 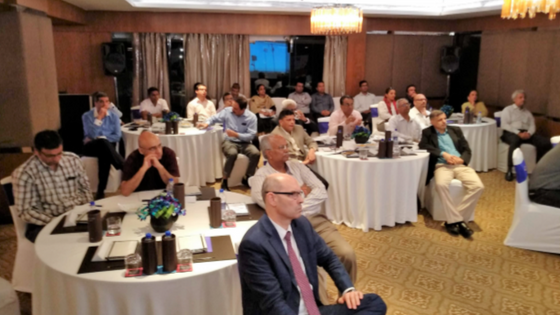 If you’d like to learn more about our network efforts in India, please review our press releases and subscribe to our blog for future updates. We would also like to thank this space to thank the many groups that helped us bring these important presentations to New Delhi and Mumbai. Earth Networks extends our gratitude to the U.S. Commercial Service, US Embassy, New Delhi, US Consulate General, Mumbai, and Skymet Weather. We couldn’t do this without you, and we are excited to continue working towards a safer India together.